In bright light, the Christmas tree looks pretty enough… but somehow still awaiting its true moment. Candlelight works its magic. The whole tree glows with a soft radiance. The light picks out the glitter of ornaments from the pools of darkness deep among the branches. The candles burn silently, yet flicker perceptibly from moment to moment. The rising air sets strands of tinsel subtly in motion, shimmering in the light. The tree is alive. More photos from Christmas 2011 are here, and from Christmas 2012 here. This entry was posted in Life, Photography and tagged Christmas, Christmas Tree, Christmas Tree Candles, Photography, postaweek, Weekly Photo Challenge. Bookmark the permalink. Love the candles on the tree. Mine is still up!!! Lovely! I love the candles on the tree, they do bring a special illumination to it. They are more work, but most definitely worth it! Thanks!! That’s beautiful christmas tree you have there. I love Christmas trees! 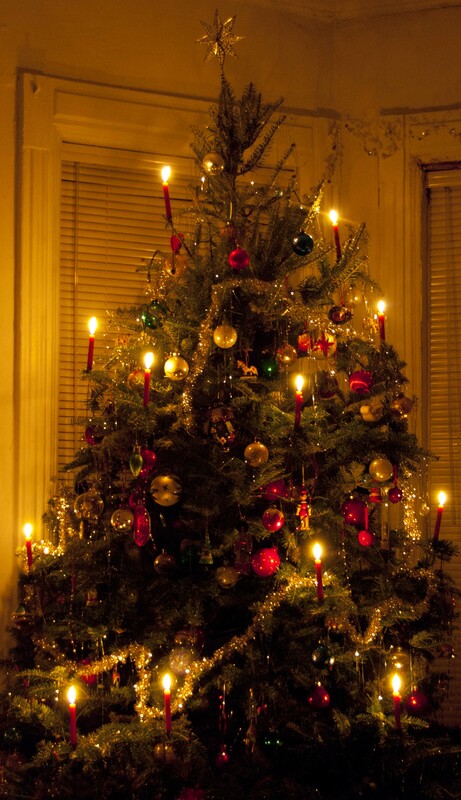 I grew up with real candles on our Christmas tree – always a bit of a fire hazard but creating a mood all its own. Thanks for stopping by my blog.